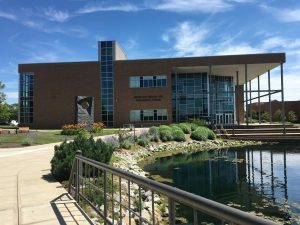 Cedarville University is an independent Baptist school known for its adherence to the Christian tradition and its belief that the Bible is the inspired, inerrant word of God (literal Biblical interpretation). At CU all academic disciplines and student life are influenced by a 14 point doctrinal statement (signed by all students, staff, and faculty). Daily chapel is mandatory and positively regarded by students. All students are required to complete a minor in Bible. Students who are aligned with the biblical perspective at CU, will also discover a broad range of academic offerings and plenty of co-curricular activities. Professional programs abound (e.g. pharmacy, engineering, nursing, education, and others). Around 60% of of the 3,000 students at CU major in a professional area and the 6 month placement upon graduation is over 90%. Co-curriculars also embody Christian Principles, with many students involved in mission, service, and outreach work. Additionally, varsity and intramural sports as well as many student organizational opportunities keep students busy. Cedarville, in our estimation, is the most conservative of Ohio’s passionately Christian colleges. 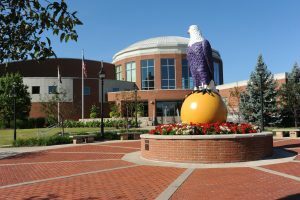 If you are looking for a small, Christian University with a commitment to the liberal arts and an investment in professional programs, Malone University is worth a visit. 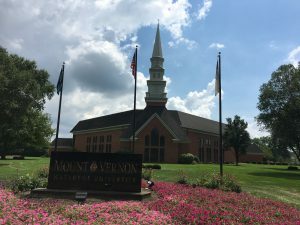 Unlike other passionately Christian universities in Ohio, Malone is located in a larger city – Canton, which is close to both Akron and Cleveland as well as plenty of internship opportunities for students. Malone boasts strong programs in Nursing, Business, and Education as well as some unique, niche programs such as the exceptional Zoo and Wildlife Biology major and the Outdoor Leadership minor. As with most Christian colleges, music and ministry-related programs are also strong. At Malone, faculty an staff are required to sign a statement of faith, but not students. The student body hails from over 40 denominations, predominantly Protestant and Catholic. Students are often asked to consider ways to integrate their faith and academics – questions such as what does it mean to be Christian and a biologist. Students are required to attend at least 20 Spiritual Formation Opportunities (SFO’s) each semester, of which chapel is just one. There are plenty of choices. While Malone doesn’t offer social fraternities or sororities, there are over 65 student organizations, a famous Cross Country program, solid NCAA Division II athletics and plenty of intramurals. In the fall, students can even enjoy Ohio’s only “Davenport Derby.” That’s “sofa race” for the uninformed. We’re not kidding. Ohio is the home of five respected “passionately Christian” colleges. 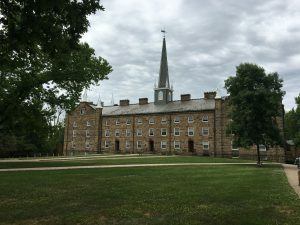 So, first a broad overview, and then we’ll hike a bit further down the trail and take a closer look at the four Ohio Christian colleges we visited this summer. 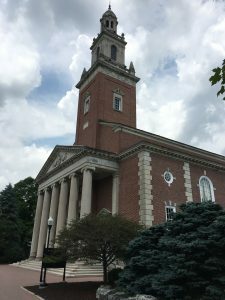 First, it’s important to understand that the vast majority of Ohio’s private institutions were founded in affiliation with a Christian denomination. Today, most of those institutions reflect their denominational heritage in their missions, values, curricular and co-curricular program offerings, rituals, institutional structure, and so on. However, over the years, most have become increasingly inclusive, diverse, academically focused, and their identity has become less reliant on their Christian denominational affiliation. So, that brings us to what I will call, “Ohio’s Big 5 Christian Colleges.” These colleges are intentionally Christian and work hard to integrate their faith perspective in all that they do. Now, from a practical “family looking for a college” perspective, what are a few of the factors that differentiate these schools from each other? 1. The nature of the “chapel requirement” – The Big 5 believe in the Christian community and, to varying degrees, bring their communities together for worship. 2. Required courses/minors – Required courses in Bible, Theology, Philosophy, and other curricular requirements vary by institution. 3. What is taught inside courses – This varies from reflecting upon what it means to be a nurse and a Christian to the study of Creationism in a biology course. 4. Opportunities for Activism – Some institutions support, to varying degrees, student activism around human rights issues. 5. Opportunities for Service – Colleges support and provide a wide-variety of service opportunities both in the US and outside to their students. 6. 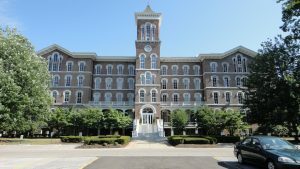 Required Statement of Faith – Colleges may require some combination of faculty, staff, and/or students to sign and adhere to a statement of faith aligned with the school’s values/teachings. 7. Conservative behavioral code of conduct – This varies from residence hall rules to codes of honesty. 8. Formation of small, supportive, Christian student groups for discussion and reflection. So, let’s take a closer look at some of these vibrant Christian communities. 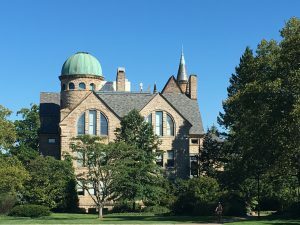 Oberlin College, one of Ohio’s “Big 5” liberal arts colleges, was founded in 1833 and was the first college in America to admit students of color and the first to grant degrees to women in a coed program. Today, many of Oberlin’s students still “bleed for a cause.” They are liberal, academically capable, and focused on making a difference in the world. 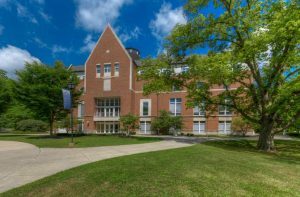 Located 35 miles southwest of Cleveland, Oberlin enrolls 2,300 students in its highly ranked College of Arts and Sciences and another 600 in its prestigious Conservatory of Music. Oberlin is a true liberal arts college as professional programs are essentially non-existent. Instead, students immerse themselves in the humanities (particularly languages and cultures), social sciences, and the sciences. Many double major and all enjoy significant interdisciplinary study. Some take advantage of research opportunities supported by faculty. The campus is beautiful, students are busy, and there is plenty to do. Of course, all this doesn’t come cheap. 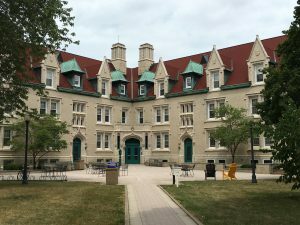 Oberlin is the 9th most expensive college in the country although, like others, they commit significant resources to providing students scholarships to reduce their cost and encourage their enrollment. 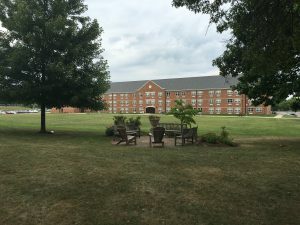 Denison University is a selective, private, residential liberal arts college located on top of a beautiful hill in the quaint village of Granville. Granville is only 30 miles east of Columbus and thus offers access to the amenities of a large metropolitan area. Dennison was founded in 1831 making it Ohio’s second oldest liberal arts college (Kenyon College was founded in 1824). Denison is a member of Ohio’s nationally recognized “Big Five” liberal arts colleges. The student body is diverse in a number of ways. First, about a quarter of students identify as multi-cultural and another 25% are first generation college students. Additionally, less than 25% of the students come from Ohio. Nearly all of Denison’s 2,200 students live on campus. Sports are popular and the university offers NCAA Division III varsity sports, intramurals, and club sports. Now, we’re not talking just any club sport – how does Fencing, Rugby, Squash, Ice Hockey, Clay Target, Equestrian, Quidditch, Rock Climbing, Sailing, and Zumba sound? If that doesn’t sound interesting, perhaps the other 180 student organizations might capture your imagination. In terms of academics, Philosophy, Politics, and Economics is a unique interdisciplinary major that attracts strong students, many of whom later migrate to graduate business or law school. The fastest growing major is Cinema and the newest is Data Analytics. Stay with us because next week we wander down the trail to to the final member of Ohio’s “Big 5,” Oberlin College – Can’t wait! Kenyon College is a private, selective, liberal arts college (one of Ohio’s “Big 5”) located in Gambier, Ohio. It was founded in 1824 by Philander Chase and is the oldest private college in Ohio. With around 1,600 students and over 150 student organizations including a vibrant Greek system, campus life is active at Kenyon. The campus is noted for its strong liberal arts curriculum, Collegiate Gothic architecture (think Hogwarts), and rural setting. The building shown above, Old Kenyon, was built in 1829 and is considered the earliest example of Collegiate Gothic architecture in the U.S. While Kenyon has many recognized areas of study, it is best known for English. Its faculty (20 strong) includes renowned teachers, award-winning poets and fiction writers, and a winner of the MacArthur Foundation’s “genius award.” As the home of the internationally renowned Kenyon Review, as well as many student-run literary publications, Kenyon is a great place to study English. The College of Wooster is a private liberal arts college with around 2,000 students, located in Wooster, Ohio. It is recognized as one of Ohio’s renowned “Big 5” liberal arts colleges. 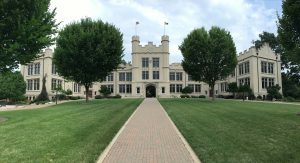 Founded in 1866 by the Presbyterian Church, the College of Wooster is best known for its emphasis on mentored undergraduate research. Wooster has an Independent Study (IS) program, in which all students work one-on-one with a faculty advisor to complete a 50-100 page written thesis (or other project) during their senior year. The project, which began in 1947, is presented and orally defended. Students are prepared for the IS with academic experiences in each of their first three years. Successful students are rewarded with a diploma, lots of pride, and a Tootsie Roll (not kidding). Students say that Wooster is “non-competitive” and “non-pretentious.” While students work hard for grades, the attitude is one of collaboration and support versus competition. Students also refer to Wooster as a “hello” campus as students consistently greet each other on campus. In terms of academics, History, Biology, Communication Studies, and English are the largest majors and are all strong, but check out Anthropology and Archaeology. Many students transfer into these majors after sampling a course or two. Established in 1842, Ohio Wesleyan University (OWU) is a member of the Ohio “Big 5” liberal arts colleges that includes OWU as well as Kenyon College, College of Wooster, Oberlin University, and Denison University. They are also one of Loren Pope’s College’s That Change Lives. With around 1,700 students from around the country and beyond (46 states and 43 countries represented), this selective university offers 90 majors, 23 varsity sports (NCAA Division III), and 100 clubs and organizations. 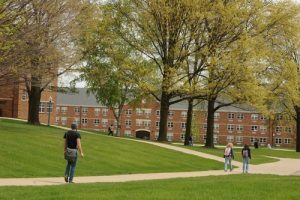 Academics are strong and focus on the liberal arts, although, unlike the other members of the “Big 5” a few professional programs, such as Education (with licensure), Business Administration, and Accounting snuck in. The Sciences, Arts, and languages are all strong. They even offer the only “Planetary Science” undergraduate program in the state. With so much to offer, I still have to warn you that they are one of the most haunted campuses in the country and even sport their own student paranormal society. In case you didn’t know, Ohio is home to five of the finest “Liberal Arts” colleges in the country. 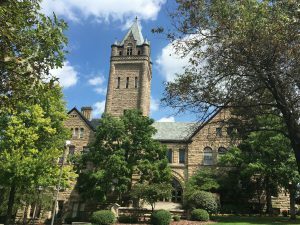 Collectively, they form the “Five Colleges of Ohio,” a consortium of Ohio liberal arts colleges which includes Kenyon College, Oberlin College, Ohio Wesleyan University, The College of Wooster, and Denison University. 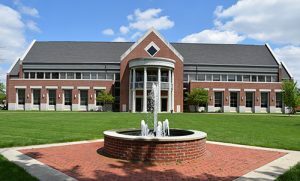 In their purest form, Liberal Arts institutions only offer degrees in the Arts and Sciences, with a particular affinity for the humanities (subjects such as philosophy, literature, religion, art, music, history, and language that focus on how people process and document the human experience) and the sciences. What they don’t do is offer academic majors in the professions. So, in a pure liberal arts institution you won’t typically see degree programs in business, engineering, social work, education (with licensure), nursing, and the like. These institutions tend to be small, selective, undergraduate-focused, liberal, teaching institutions with big endowments (savings accounts), and a broad reach (recruit well beyond Ohio’s borders). They value an interdisciplinary approach to education so tend to organize their curriculum to encourage breadth over depth and connections over silos. They work hard to develop a student’s critical thinking and verbal and written communication skills. In most cases, over 50% of graduates move on to graduate school within a few years of completing their undergraduate work. These are fine institutions, but not a good fit for everyone for a number of reasons. I’ll have a lot more to say on that further down the trail! Thanks for hiking with us. Welcome to our Blog: The Trail Starts Here! Welcome to the College Bound Advantage Blog Page! We are glad that you are here.The purpose of this page is to enlist you as a participant on our journey across Ohio to visit its many private and public colleges and universities. We began this journey last May and will be continuing through October, 2016. By the time we get off the road, we will have visited around 50 Ohio colleges and universities. We’ll try to offer a post capturing a few ideas from each of our campus visits, although some retrospectively. Along the way, we may also offer a few ideas on the higher education landscape in Ohio. As we travel, Know that we will be assuming, with very few exceptions, that you and your student can easily find a college or university that can offer an exceptional undergraduate experience aligned with your priorities right here in OHIO! 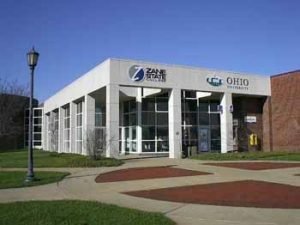 Few states in the US have nearly as many private and public institutional offerings as Ohio. We believe that far too often, parents “export” (not our term, but one used in related studies) their student out-of-state only later to realize that their choice yields a lifestyle of traveling around the country to visit their kids and, later, their grandkids. At CBA, we are a voice encouraging families to look in Ohio first! So let’s get on the road and see what we can find. Remember, at CBA, we can help you find your perfect Ohio college fit – The Trail Starts Here!